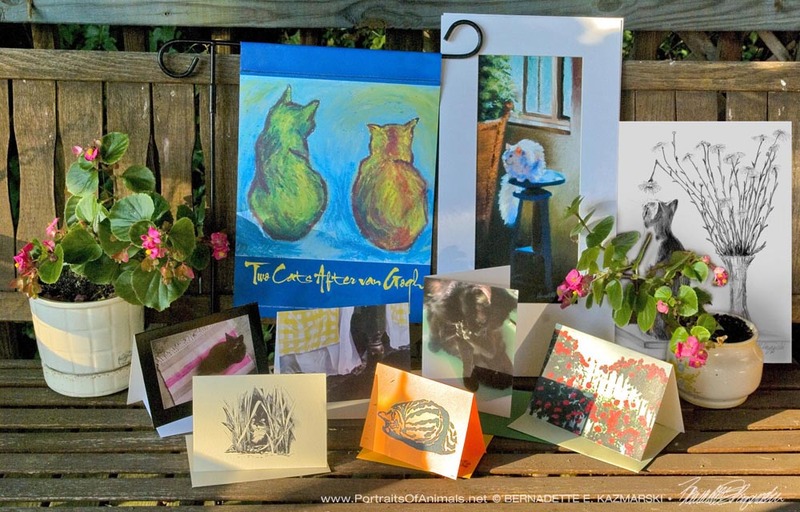 My July 2016 Feline Sampler Box is full of the colors and events of summer, and art and photos that depict a lot of kitties enjoying the sun, special kitties who I remember fondly in the month of July, and even a tribute to our community cats. Part of the challenge this summer has been photographing the boxes! If you didn’t notice in other areas of this site, I love to photograph my merchandise outside, like framed artwork, handmade goods and such, and since I maintain a Backyard Wildlife Habitat there is always a good seasonal place to photograph with an interesting backdrop. But when my tree came down at the end of July and took out what’s growing in half the front yard and half the back yard and it’s gotten overgrown as I try to rebuild without much time and difficult weather, my choices are limited. 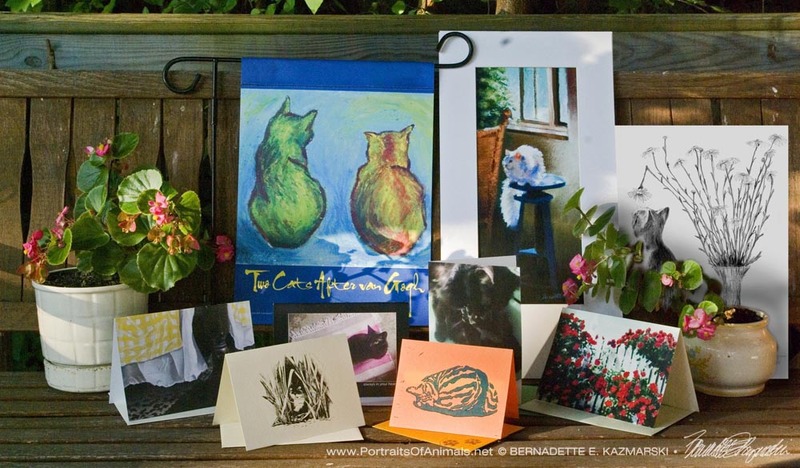 But when I saw the swing on my deck with the morning sun, and Mimi was amenable, I knew that was the perfect spot for a summer sampler box photo shoot. “White Cat Reflecting” matted to fit 10″ x 20″. Sometimes a more finished, finely-detailed painting isn’t the best way to capture an animal’s personality, and especially not my capricious little Sally. I believe I painted this in June because that’s when the sun comes in the dining room window at this angle, but Sally in all her brilliant colors are full of summer. I had been focusing completely on Sally’s beauty, but one of the elements I hadn’t anticipated when I went to work from the photos was Sally’s reflection of light back onto the surfaces around her. When I looked at the spot after she’d moved, it was all dark. The back of the rocker, the wall behind her, I hadn’t realized until I looked at the photos that those areas only had light because it was reflected from her, hence the double meaning in the title. 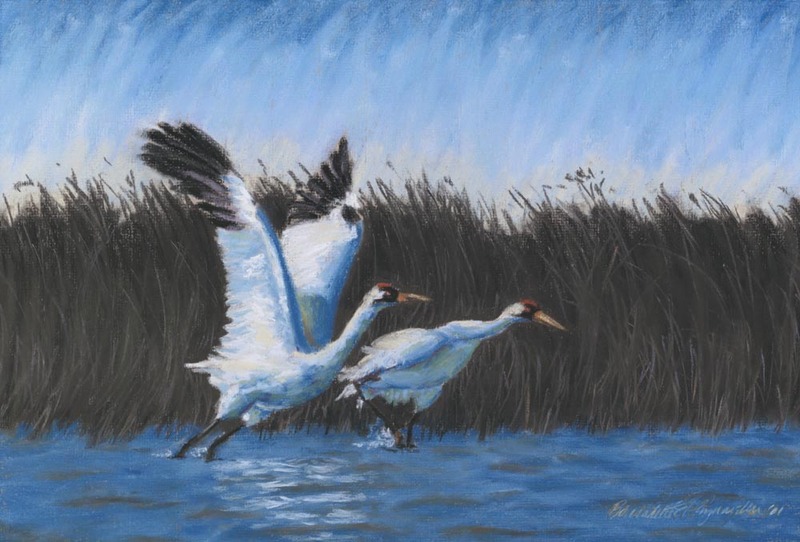 While this art appears impossibly tall, I’ve matted it to fit into a 10” x 20” frame which is commonly offered with a multiple-opening mat as a collage frame in many colors and styles at craft stores and department stores. 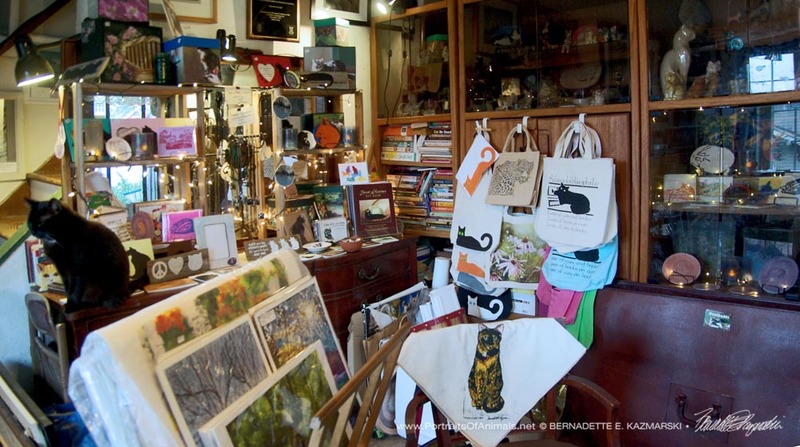 You can also find White Cat Reflecting in my gallery of feline artwork. I call pencil “my first and favorite medium” and I often say that “I can speak in pencil”, that what goes in my eyes and comes out the tip of the pencil has very little logical translation much as you would speak fluently in more than one language. I see the scene, and I see the pencil drawing. That’s also one of the reasons you’ll see so many of my daily sketches in pencil, and I have a huge body of works in pencil featuring my cats, commissioned portraits, wildlife, landscapes, waterscapes and flowers. 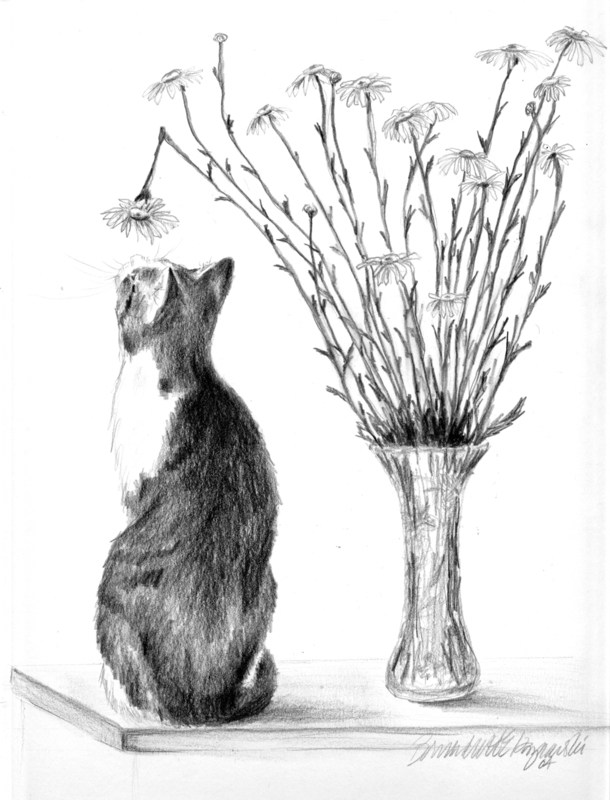 So when I saw Namir stretching his entire slender self up toward a downward-facing daisy I looked at his crisp gray fur with its muted stripes, his graceful curving figure, the simplicity of the daisies and immediately decided I had to do a pencil sketch entitled “Conversation With a Daisy”. Because Namir would talk to a daisy. 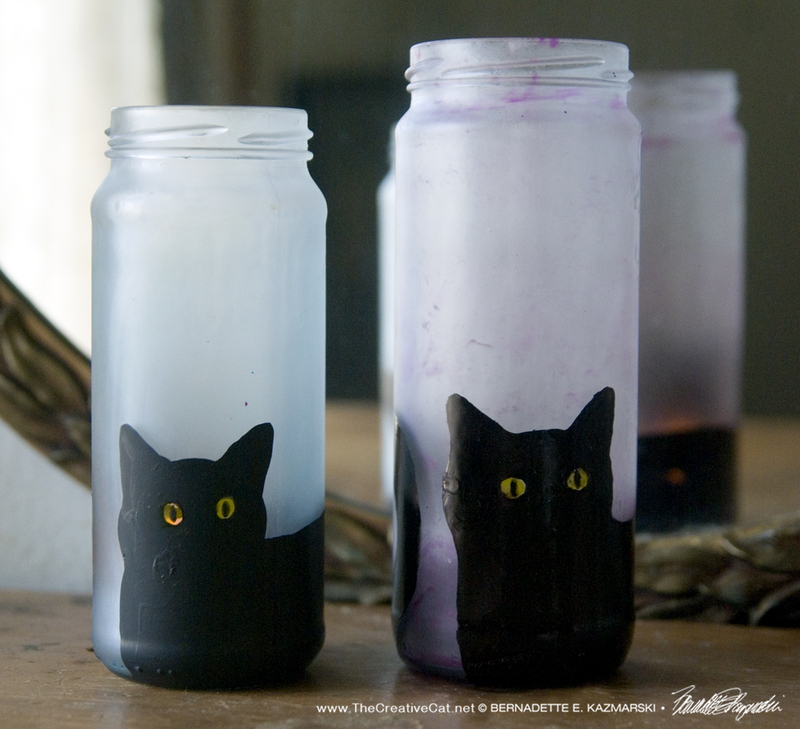 I had carried in an armload of my Shasta daisies that had been knocked over in a summer storm and put them in the crystal vase on the kitchen cabinet, always a risk in a house of cats who ate nearly all green things but who considered freshly-cut flowers a special treat. One of them had indeed been bent and was facing downward. Seeing Namir I snapped several photographs, but he would not stretch himself out again and sniff that daisy! 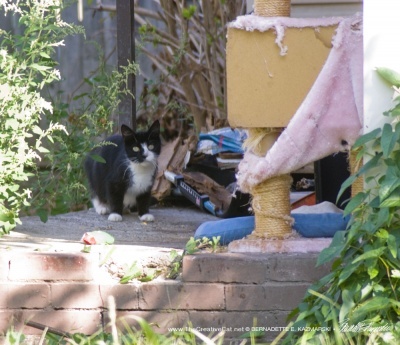 “I already did that, I don’t have to do it again, cats only sniff things once and then they know all about them,” he said. So much for me, but I know how to get my models into the positions I need, and this one was easy: hold any object above his head in about the position the daisy had been, snap! Sketch. I remember Namir in July, when he lost his longtime battle with heart disease, but only after a long life of conversing with daisies and such like. 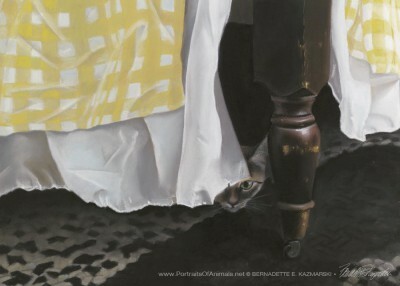 You can also find Conversation With a Daisy in my gallery of feline artwork. “Big Game Hunter” from “Kitties Being Kitties” set. 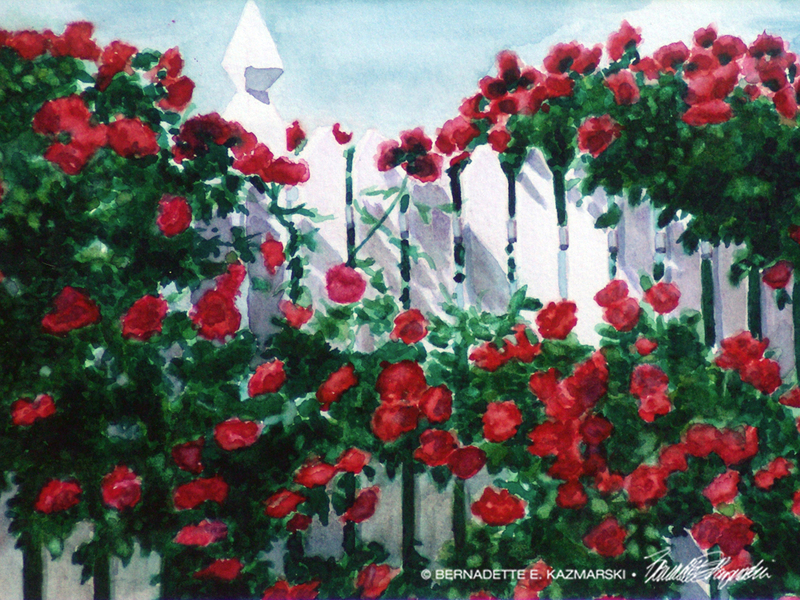 Red Climbers, watercolor, 12 x 16 print or canvas. 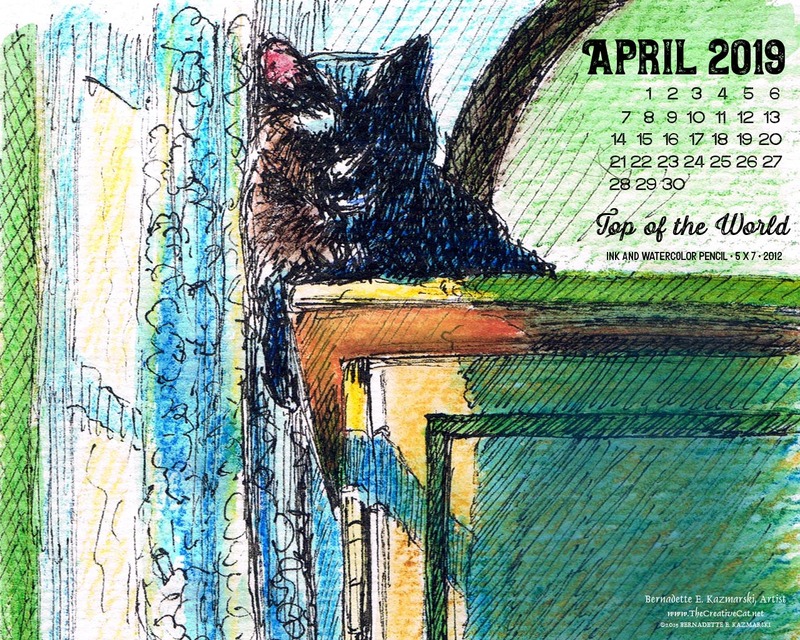 The sympathy card for this month, “Lucy in the Morning”, features Lucy on her “beach towel”. 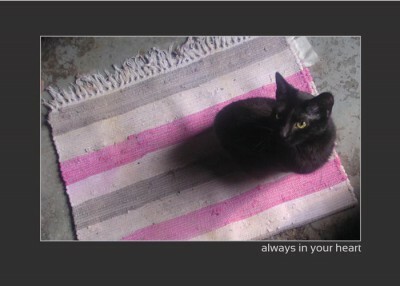 I had used this pink and gray rag rug for gray tabby Moses to lie and soak up the sun on the concrete basement floor, and it coordinated just as well with Lucy, who joined us just a few months after we lost Moses. I chose this image as a sympathy card because the scene looks like one that could be in any home, and the bright pink adds cheer to ease the somber nature of the card. Lucy left us in July, succumbing to the effects of FIP, but she sent her mother Mimi to us, bringing a new family of four. 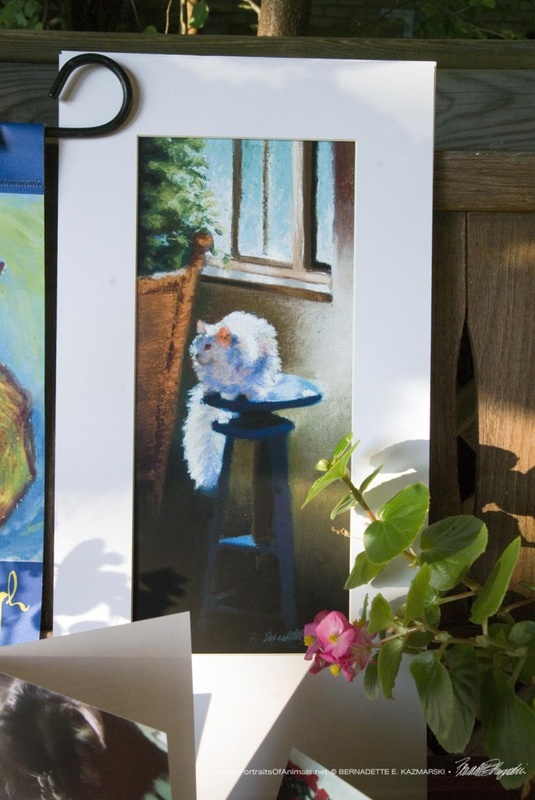 The art card is “Waiting for Mom”, and though this was actually a painting with winter light I wanted to include little torbie Fawn and a pastel painting in a photorealistic style. 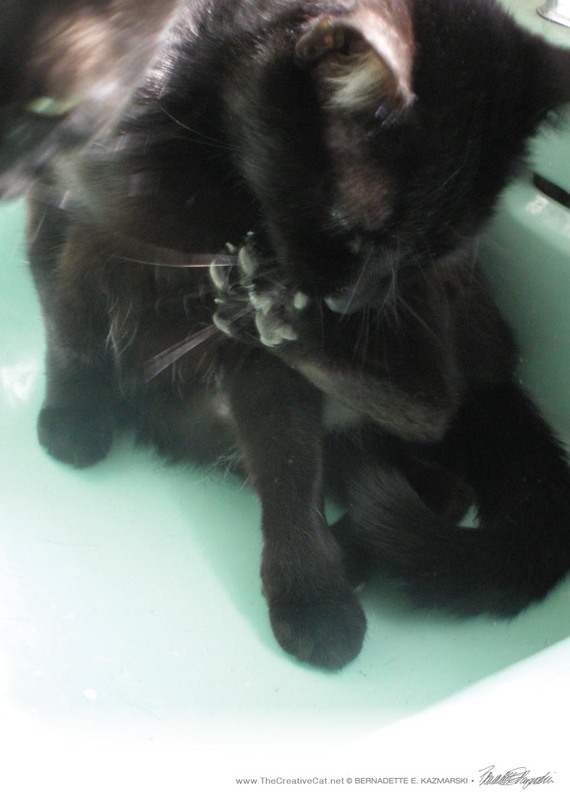 The photo card is “Toe Cleaning in Black and Green”, discovering the magic of black and green and the green reflection of the sink on Jelly Bean’s fur and especially his toe pads, and I also like this photo for its somewhat abstract quality. They can work for family, friends, co-workers as a friendship, sympathy, thank you, thinking of you card, or could be a small framed print on your wall. Sometimes a big greeting card just isn’t what you want to send. 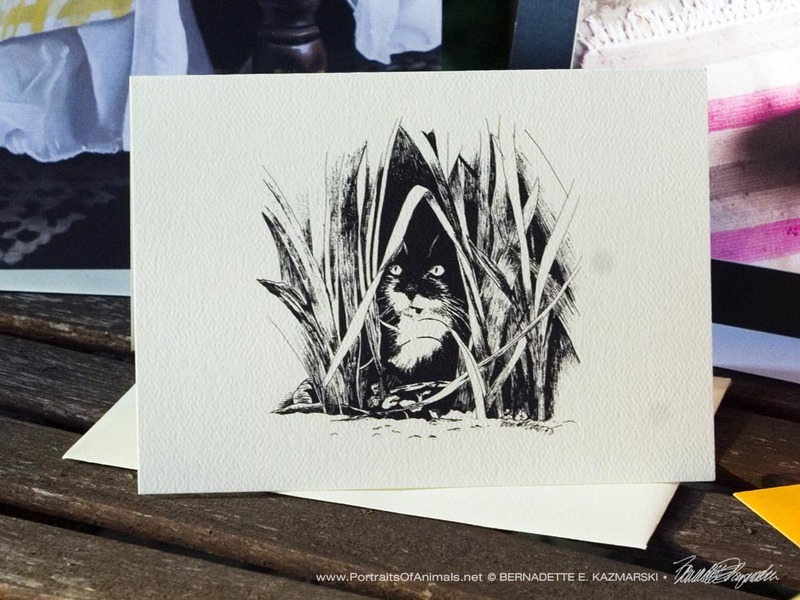 Here’s another medium, coat pattern and kitty with, “Big Game Hunter”, part of “Kitties Being Kitties“, a tuxedo kitten stalking through the grass as if he’s a big tiger in a classic small ink sketch note card to honor our community cats. The second note card is a colorful variation on my block-printed “Tabbies” set, usually printed in earth tones on earthy paper, printed in “Summer Brights” on randomly chosen bright paper and ink colors. 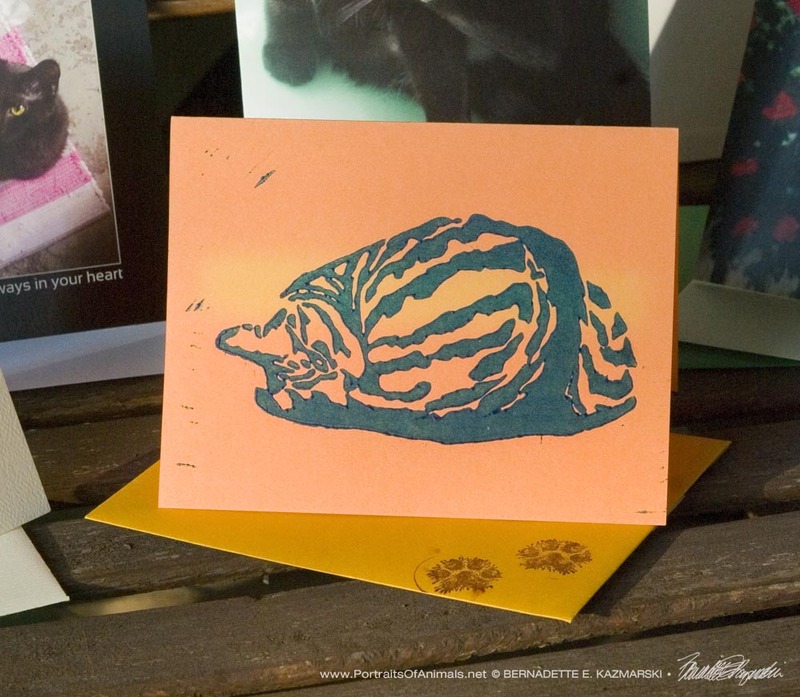 Then just for more variety and to share other art and themes I’ve designed for, I include a non-feline greeting card each month. “Red Climbers” is a decidedly July subject when the red ramblers bloom all over the fence in a watercolor I painted years ago and publish as prints and greeting cards. 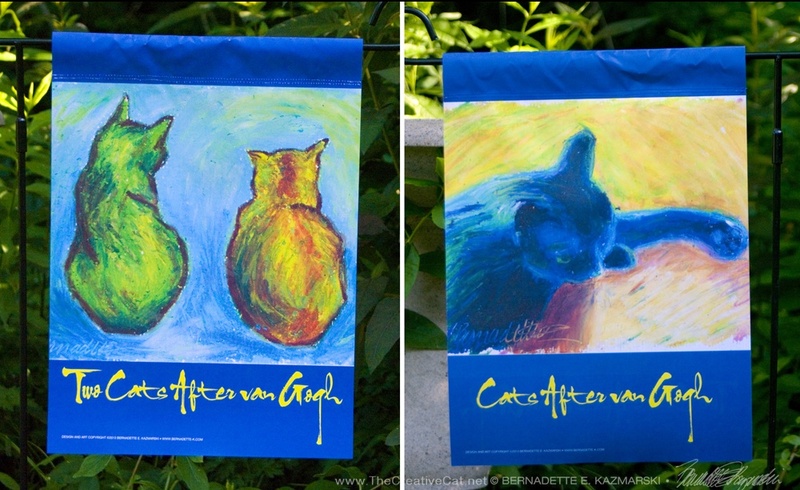 This flag is 11” x 15” and features two different pieces of art on each side: the original “Two Cats After van Gogh” sketch on one side and “In Window Light” on the other side, both in my “after van Gogh” style of oil pastel. 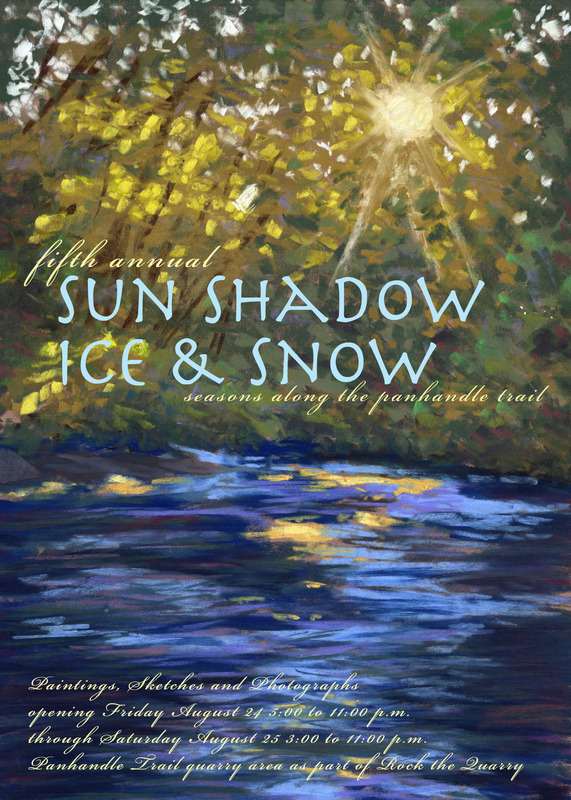 This set of illustrations won a Muse Medallion, and the flag itself won the President’s Award in the 2013 Cat Writers’ Association Communications Contest. 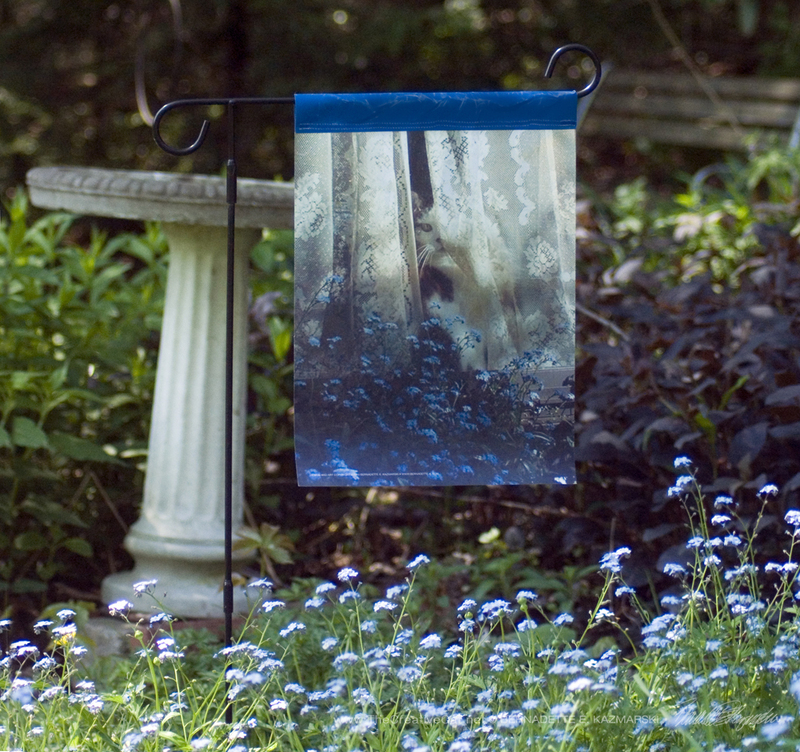 Garden flags are digitally printed on both sides of a heavyweight, durable indoor/outdoor woven printable fabric, and I finished by adding the rod pocket. The packaging is another portion of what comes in the box: wrapping paper, of a sort! 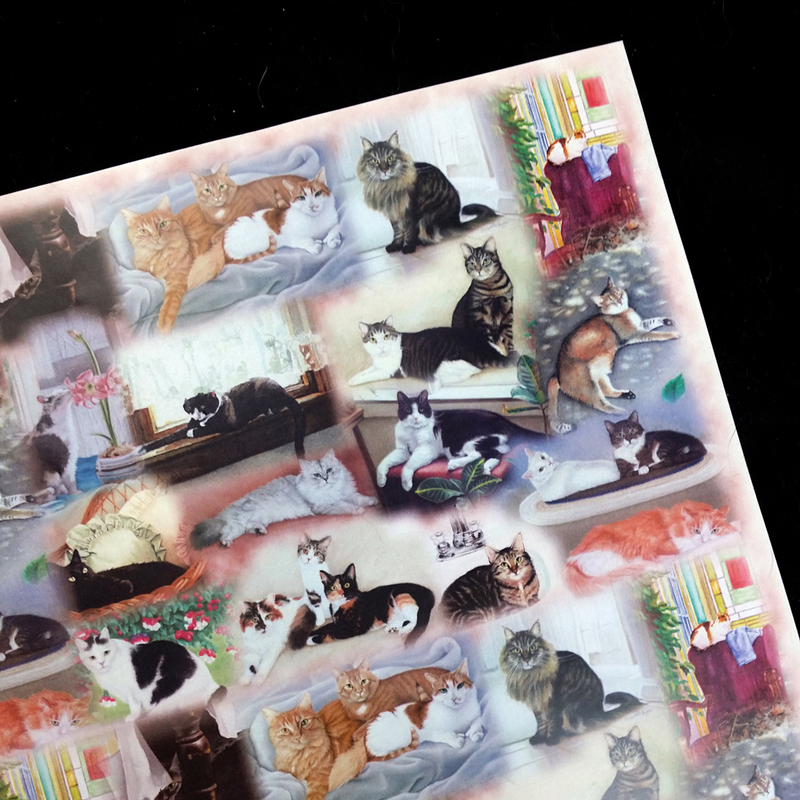 I used minimal tape and sheets of my art paper which are heavy enough to withstand a little taping, and that gives you two 11” x 17” sheets of cat-themed wrapping paper. 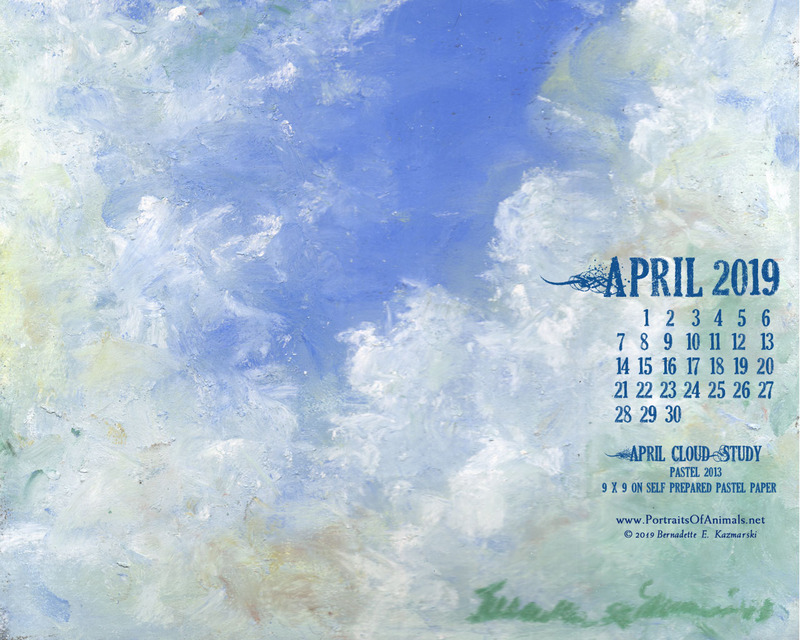 This month it was “Just Fits” for the colorful nature of the season.